This hotel is 100pct non-smoking Recently renovated Hilton Atlanta Perimeter Suites hotel located in Atlanta*s premier business district is conveniently located off I-285 between I-75 and I-85 and is just minutes north of Downtown Atlanta near Perimeter Mall and the Dunwoody MARTA station. The hotel provides easy access to Atlanta*s vibrant business community and Hartsfield-Jackson International Airport. 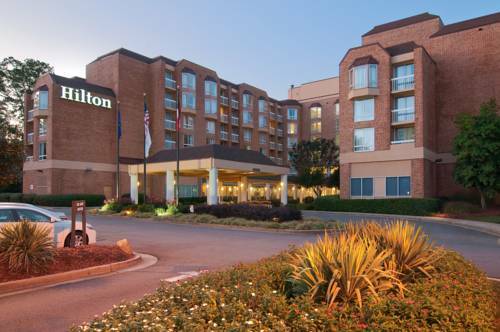 Hilton Atlanta Perimeter Suites is a first-class all-suite hotel featuring an attractive contemporary design and spacious two-room suites with amenities such as Executive Lounge WiFi two TVs coffee maker iron/board microwave and refrigerator. In-room whirlpool or two bed suites are also available as an upgrade. Relax by the interior garden courtyard enjoy our indoor and outdoor pools and whirlpool or work out in the fitness center. Atlanta GA visitors can also enjoy delicious continental cuisine at the Dunwoody Grill or their favorite beverage in the Dunwoody Lounge. This Atlanta Perimeter hotel is minutes from all that Atlanta has to offer. Allow the Concierge to assist you with arrangements for popular Atlanta attractions like Stone Mountain Park the Coca Cola Museum CNN Studios the Georgia Dome Georgia Aquarium Phillips Arena Braves Stadium or Six Flags Georgia. Explore shopping meccas like Buckhead Village the Mall of Georgia and Discover Mills Outlets. Our hotel provides a complimentary shuttle service to destinations within a three-mile radius of the hotel. The hotel*s meeting spaces. ballroom and boardroom will accommodate your conference training or seminar event with full catering and audio visual equipment support. Our 4 000 square-foot Pavilion is perfect for your event up to 250 guests. A credit card guarantee is required on all reservations regardless of arrival time. See rate details for more information. Continental cuisine in a casual and inviting atmosphere. The creative array of dishes presented by a friendly experienced staff will make your dining experience at the Dunwoody Grill a delightful treat. Upscale seafood. Fantastic food. Private dining available.